** Arizona, Illinois, Virginia, Washington, New York City, Washington, DC. But the Virginia Department of Health (VDH) does not think it should be a priority to track foreign-born TB cases by category, as do 44 states who have provided the CDC with that data since 2012 (Tennessee became the 45th state to do so in 2014) in its annual Report on Tuberculosis in the United States. “The Virginia Department of Health does not collect the data you have requested,” a spokesperson for VDH responded when Breitbart asked to know the immigration status upon first entry of the 168 foreign-born residents of Virginia diagnosed with active TB in 2015. “When the revised Report of Verified Case of Tuberculosis was adopted in 2009, the additional variables regarding immigration status were not required by CDC to be collected. 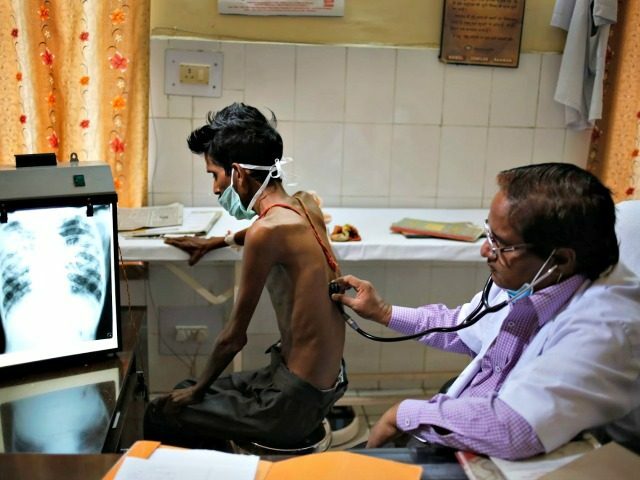 The Virginia Department of Health TB program did not consider this information a priority for surveillance, since it already collected country of origin and arrival date for foreign born people,” the spokesperson responded when Breitbart asked why Virginia fails to provide the data 45 other states do to the CDC. The overwhelming evidence presented in numerous medical reports shows exactly the opposite–the per capita rate of active TB among refugees is much higher than the per capita rate in the general population, and by an order of magnitude. The rate of TB among the general population was 3.0 per 100,000 in 2015. In contrast, the estimated rate of TB among refugees nationally exceeded 20 cases per 100,000 refugees that same year (409 cases diagnosed in 45 reporting states where an estimated two million refugees reside). In states where foreign-born cases of TB are significantly above the national average, like Virginia, the estimated rate of TB among refugees is even higher. McAuliffe has been a long-time advocate of open borders and refugees. In November 2015 he very publicly refused to ask the Obama administration to halt the resettlement of Syrian refugees in the state. “Gov. Terry McAuliffe said Tuesday that he would veto any attempt by the General Assembly to block Syrian refugees from coming to the state, dismissing the idea as ‘political posturing’, ” Richmond.com reported at the time. The number of Syrian refugees resettled in the state by the Obama administration increased significantly after that statement, from 21 in the three years between FY 2013 and FY 2015, to 196 in FY 2016, according to the Department of State’s interactive website. Sixty-one Syrian refugees have been resettled in Virginia in the first three months of FY 2017. Virginia’s problem with foreign-born TB began before McAuliffe was elected governor in 2013. In 2002, for instance, foreign-born TB cases were only 60 percent of all TB cases in the state. Since then, a total of 19,213 refugees have been resettled in the state, according to the Department of State’s interactive website. In 2007, an influx of refugees from high TB burden countries like Bhutan and Burma began. In the four years between FY 2003 and FY 2006, 117 refugees were resettled in Virginia from Burma. In the four subsequent years, FY 2007 to FY 2010, 969 refugees were resettled from Burma. In the five years between FY 2003 and FY 2007, no refugees were resettled in Virginia from Bhutan. In the five subsequent years, FY 2008 to FY 2012, 2,233 refugees were resettled from Bhutan. Virginia does, however, track country of origin for foreign-born TB cases. In 2015, 23 of Virginia’s 168 foreign-born cases of TB were from the Philippines, 17 were from Viet Nam, 17 were from India, seven were from Haiti, five were from Mexico, one was from China, and 98 were from “all other” 136 countries. Very few of the 69,933 refugees resettled in the United States in FY 2015 arrived from the Philippines, Viet Nam, India, Haiti, Mexico, or China. The vast majority–99 percent, or 69,843 out of 69,933–arrived from the 136 countries in the “all other” category. (69,843 out of 69,933). In FY 2016, 99 percent of the refugees resettled in the United States (84,878 out of 84,995) arrived from the 136 countries in the “all other” category, according to the Department of State.